Just off the main Cerro Punta road in Volcan, on the church grounds, is a small building used by the local branch of Alcoholic s Anonymous. On Tuesday’s of each week it provides a very different kind of diagnosis and treatment. Fifty year old Damaris Rivera, and forty year old Dilcia Rosas, have, for the past twelve years been running a Bio-health or Bio-Salud clinic. They use a form of “Energy Kinesiology” to diagnose a myriad of health problems from parasites through kidney and liver complaints all the way up to cancer. 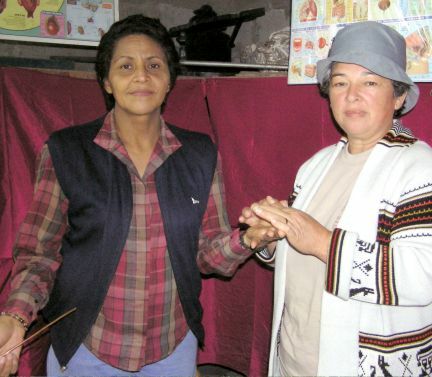 Damaris and Dilcia are not “Faith healers.” Damaris made it quite clear that this is a learned technique, and she believes that anybody could do it. The process is quite simple, a patient enters the clinic, they have their blood pressure taken, and then they enter the small cubicle where Damaris and Dilcia work together to diagnose the complaint. Kinesiology was first developed in 1964, by a Michigan, chiropractor, Dr. George J. Goodheart. Since then, many different forms have evolved, using variations of the basic muscle tension or balancing technique. A colleague of Goodheart’s, Dr. John Thie, D.C. then discovered the link with Chinese acupuncture meridians. Damaris and Dilcia’s process uses elements of both Chinese and Japanese alternative medicine. 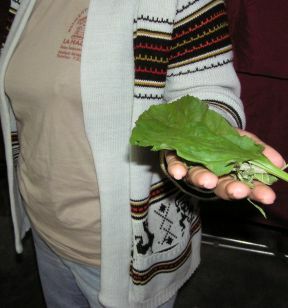 The process is strange to say the least: Dilcia will ask you to hold out your left hand into which she places a herb. You are asked to keep the arm level and steady as Dilcia uses her left arm to run a short, copper rod, up and down and over your body. 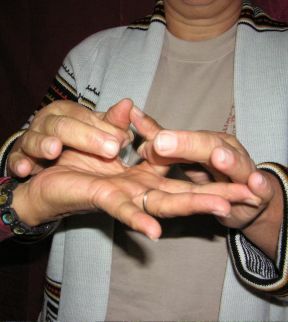 All the while Dilcia’s right hand is connected to Damaris’ left hand by means of interlocking thumb and forefingers, forming a small round circle. As I understand the process, there is a flow of either positive or negative energy flowing along the meridian lines between the patient and the interpreter. In my case Damaris pulled gently on the fingers of Dilcia and depending on whether the fingers opened easily or not, determined the positive or negative energy flowing from the test rod held in Dilcia’s hand. At first, the copper test rod was passed over my body, but then, I was asked to place my hand on a series of photographs. 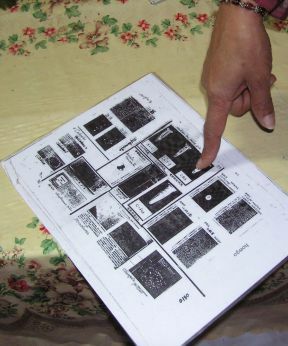 The pictures were actual microscope slides of blood ailments and cancerous tumors. The idea is that the photographs of actual tumors, give off a negative vibration or energy, this is then transmitted through my fingers and through the two women. Damaris, at the end of the chain will see if the inter-linked fingers open or close: thereby determining if my body reacts to the energy given off by the tumor. Simply put, if I, for example, pointed to a cancerous tumor and the energy was negative, that would be a cause for concern and give me the opportunity to use conventional diagnostic treatments for verification. It sounds very interesting, but does this process work? My wife first tried it and was amazed at how accurate the findings were; She was told that her cholesterol was a problem – A previous blood test had shown this to be true. My bill of health was comparatively good, although I did show the signs of early diabetes. The clincher for me was when Damaris accurately deduced that I was having problems with sciatica; something that extensive doctor visits and tests failed to show in Canada. I asked Damaris and Dilcia why they gave up their time and energy to do this work. They both said it was because they wanted to help poor people. The cost for a diagnosis is just $3.00 but if you are sick and can’t afford it, they will examine you for free. The final part of the process is that you are given a list of recommended herbs that will help with your ailment. Is this a viable alternative diagnostic service? Damaris tells me that a doctor at the local health clinic, has now become a believer. The bio-salud clinic is open Tuesdays of each week from 8:00 to 3:00 in Volcan, and once a month in Rio Sereno and Alto Quiel.